Dust. Just when the weather improves with the start of Spring and you want to get outdoors – that’s when the dust comes. You know it’s coming when you get that tickle in the back of your throat; you can’t seem to stop coughing even though you don’t have a cold; your eyes are watering and your head is throbbing… Then you go outside and look up and you realise that you can’t see the sun… Or a patch of blue sky. Just a thick layer of heavy, suffocating dust. For those of us who have lived here a while, it feels like every year it is getting worse. Some of you will remember the particularly bad dust storm we had back in 2015 when you couldn’t see more than a few feet in front of you. 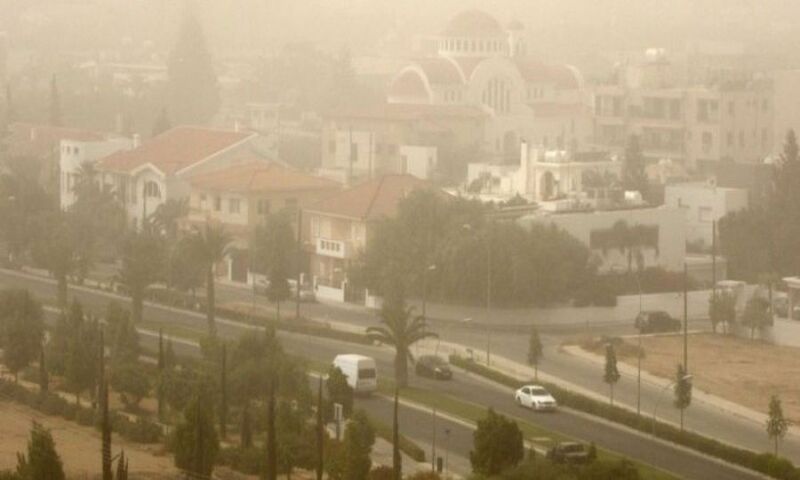 Seasonal air quality is a topic that is causing a lot of concern for those of us in Cyprus, Israel, Greece and other parts of the Med and wider regions affected by these dust storms. I can only imagine how much worse it is for the people living in the regions where the dust storms are originating. For those of you who have a member of your family with asthma, allergies or respiratory problems, it must be even more concerning. To try to put it in to perspective though, however alarming these dust storms may seem and just how bad they can be when we are living literally in the thick of it, they are nothing compared to the conditions that people live in daily in heavily industrialised and overpopulated cities in some parts of Africa and Asia, where the pollutant levels are consistently bad throughout the year and have far worse health effects because they are due to harmful vehicle, fuel and industrial emissions. Apart from those few weeks of dust storms each year, Cyprus is considered to be one of the safest and cleanest places to live – our beaches are among the best in Europe; the air quality is generally much better than most urbanised areas and the prevailing coastal winds blow away much of the worse pollutants that we ourselves create. So, are the dust storms actually getting worse? Sand and Dust Storms are “the result of several inter-dependent factors, which span across several regional countries. Years of inappropriate farming practices, mismanagement of water resources and climate change continue to contribute to reduced vegetation coverage, desertification and droughts, which directly contribute to the growing regional dust-storm problem” source. In plain speak – climate change, along with human activities such as overcultivation; overgrazing; deforestation and poor irrigation practices, made worse by the effects of unstable political conditions in many regions (war and population movements leading to lack of farming and further degradation of the soil) has lead to once fertile soils now being turned in to barren and unproductive patches of land. The ensuing drought and desertification in sub-Saharan Africa and the Middle East mean that these problems will only get worse. Couple this with increasing levels (worldwide, not just in Cyprus) of air pollution from industry and fuel combustion (household uses, traffic etc) and the picture can feel a little bleak. The Governments and Academic circles of the affected countries are carrying out research on what materials these dust and sand storms are made up of – and how and to what extent they can negatively impact upon our health. Without pretending that I understand this in depth, it appears that there are different weights of particles in these storms and not all of them are inhalable. “Inhalable particulates” are those with a diameter of less than 10mm (PM10) and these are the ones that we are most concerned about – the Air Quality Department monitor them continually and warn us when they go over the recommended safe limit of 50 mg/m3 (micrograms per cubic metre). That is, the maximum concentration of airborne particulates that can be present outdoors without being deemed a risk to public health. The last week has seen levels between PM10: 200 – 400 in certain areas of Cyprus. That is: four to eight times the recommended safe limit of inhalable particles in the air. However, the extent of the risk on our health is still being researched and while the coughing, sneezing and headaches associated with dust storms can seem alarming, they are generally short-lived and are of most concern to vulnerable population groups. 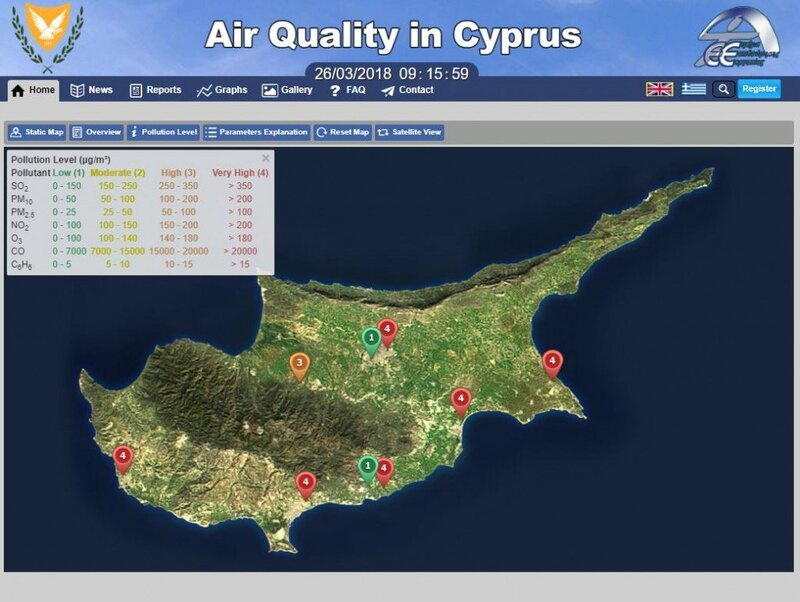 source: Air Quality in Cyprus department’s homepage this morning, 26-03-18. While we all are affected by particularly bad episodes of dust, the most vulnerable population groups are: children, the elderly and people with poor respiratory health. 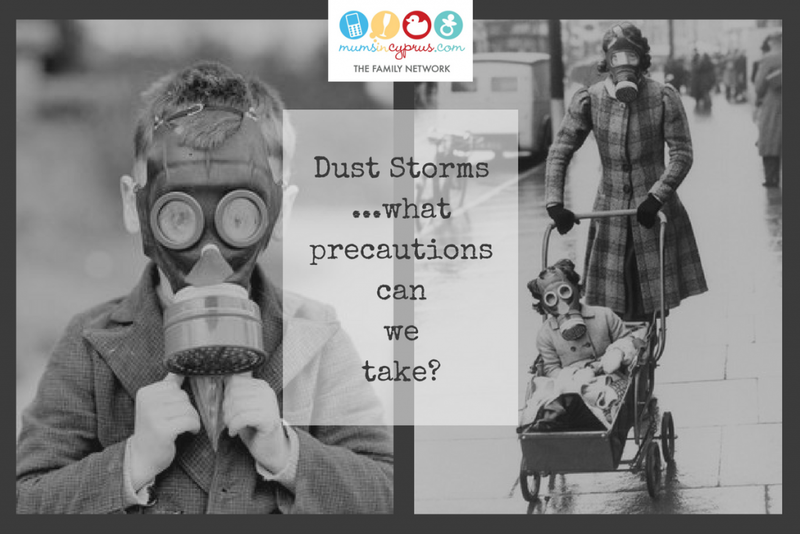 We still have to live everyday lives – go to work, our children still need to be schooled… How do we protect ourselves in a dust storm? Download the Air Quality Department’s extremely useful mobile application that warns you when levels of dust are high. Stay indoors (with windows and doors closed) or limit outdoor activity during particularly bad episodes of dust. This especially means no outdoor exercise, as you will be putting yourself more at risk. Make sure to keep your windows and doors closed during the days of high dust levels. If you need to go outdoors during a particularly bad episode, you can choose to wear a mask, or protect your nose and mouth with a wet cloth. In the car, keep windows closed and make sure the air/air conditioning is being circulated from the inside, not outside air source. Take extra measures for the very young and old – and for those with respiratory health issues. Possibly consider installing an air filter in your home, like these ones here from Karma WaterShop Cyprus. It’s encouraging to see that the Ministry of Education has now started recommending restrictions on outdoor activities/field-trips for children on days when the limits are over the recommended safe levels. A lot of schools have recently been keeping their pupils indoors during particularly bad dust storms, or at least restricting athletic activity during those days. If your school has not been taking any of these measures, make sure to talk to the Director of your school about your concerns. Not enough research has yet been done and while it is being undertaken at the moment, it might be a while before updated recommendations and regulations around dust storms have been issued. We would advise you to use your common sense… if you feel that the dust is affecting you or members of your family particularly badly, stay indoors and wear a mask if you need to go outside. If you have concerns, it is best to speak to a respiratory health specialist and to the Air Quality Department directly. Most importantly, try not to panic! We’ll update this article as and when we have further information.